Are you looking for the best of the classic wood style, but sick and tired of all of the maintenance required to keep it in an acceptable condition? Then you’ve found the perfect solution, with wood-effect composite garden furniture you won’t need to oil it, cover it, or sand it down, you can simply leave it outside all year without a care in the world. The beauty of this is that it also has a grain effect, which makes it look and feel like real wood, even from close up, the perfect option for a traditional garden, that wants to add a bit of modern feel and convenience to their garden furniture. You can buy wood effect benches, love seats, or coffee sets, and we also have a range of wood effect dining sets for you to purchase online. 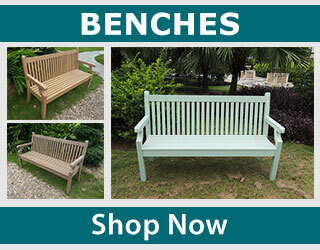 Shop our range today, and if you have any questions we would be happy to help you. This composite outdoor furniture is fantastic as chairs, benches, bistro sets, or dining sets, and the fake / artificial wood effect keeps your garden looking natural but giving you the convenience of weatherproof.